Green Toys, a company known to use 100% recycled materials and US-based manufacturing, is serious about being eco-friendly and safe. It amazes me that they can make such cute, functional toys out of recycled material. For instance, the Green Toys Sport Boats are made of 100% recycled plastic milk jugs. Say what?!! The sport boats are specially sized for little hands and can be used in water. There are three boats available - blue Launch Boat, orange Race Boat, and green Speed Boat. The tops are interchangeable with each other. Each boat includes a duck captain figure that can be set inside the boat. What was once a milk jug is now a nice toy for little kids. Going even further with eco-friendliness, each Sport Boat is packaged using recycled materials. The Green Toys Sports Boats would make a nice stocking stuffer this holiday season. 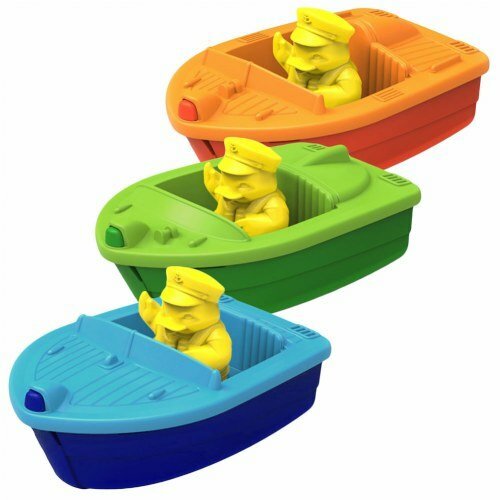 One person will win a Green Toys Sport Boat. Visited the site and I like The Scooper. I also really like the new Mixer truck! I also like the dump truck. I know my son would love to get the airplanes to play with! I love the fire truck from Green Toys. I like the fact that they offer the tool bench toy in both blue AND pink! I really like the Fire Truck toy. I also like the Block Set. I love the tea set! It's on my wishlist for my daughter. The Rocket wold be fun for my nephew! Love the Build a Bouquet~! I like the orange tractor for my son. I also love the Train set! I like the Sea Plane. I would love to win a block set. I also like their Green Toys Pizza Parlor! My son would love the submarine. I really like the tea set, perfect for my niece, we love to have pretend tea together! I like that they have a variety of different toys for boys and girls. I like the salad set. I like the Tea Set! I also really like the Dump Truck! My son has, and loves, the dump truck! I also love the Cookware & Dining Set.. My grand daughter would love it. I like the sub and watering can. I like the Ferry Boat with Mini Cars. Looks fun! I have purchased Green Toys before and they are an awesome product! I like the Orange Tractor. I love the Pink Tool Set! The seaplanes to go along with the boats! I would also love the twist teether :) ty! I like the dig and discover set. The Build-a-Bouquet is too cute! Love the blocks as well!! I bought the ferry boat with mini cars for my son, he loves it! I also like the tea set. It looks like a really cute, classic toy. I love the train, in pink. The dig & discover set is nice. I love that is recycled material. The shape sorter would be great for our son Elliot! I love the blue and red Train. I heart the Pizza Parlor Set! I like the tractor. The submarines are cool, too. My little guy would love the Dump Truck! Thanks for the chance to win! I like the teal Stove Top. I have never seen that before. Its just the right size. I like the Green Toys Block Set the most of all choices. The Tea Set looks very nice!